"What goes around comes around", and since we do good for the past days, McDonald's will give us a good treat as well, it will add some excitement to our otherwise routine and boring day. Break out from your usual and welcome a change in pace. 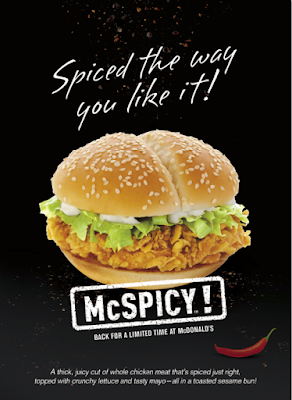 The answer to our craving is the McDonald's McSpicy! 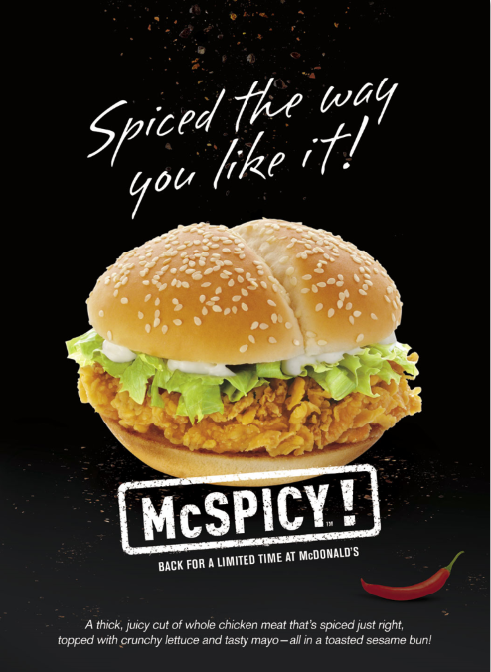 McSpicy, McDonald’s is here again that were made more juicy cut of 100% whole chicken meat, marinated with the perfect blend of flavors, spiced just right for the Filipino palate like our. It’s topped with crunchy lettuce and creamy mayo, and sandwiched in a uniquely shaped, toasted sesame bun. Here's more!! it is perfect combination with McDonald's McFreeze ( Frozen Coke or Frozen Royal), an equal mix of goodness with its yin-and-yang match. Did you notice also the new TV commercial featuring Elisse Joson and McCoy de Leon? (loveteam popularly known as “McLisse”). Follow the kilig they will be offering. You can also join the discussion online and share your photos on Facebook, facebook.com/McDo.ph or tag @McDo_PH on Twitter or Instagram.